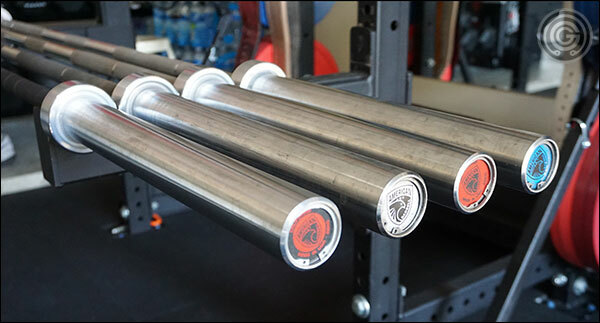 I’ve been getting a good number of questions about American Barbell lately; namely about their Urethane Bumper Plates and an issue regarding rust on American Barbell bar sleeves. I wanted to tackle these two questions as well as just make you aware of an opportunity to get a blemished AB bar for a bit less cash. This should be a quick read. Do American Barbell bars rust? Are American Barbell Urethane Bumpers Different? 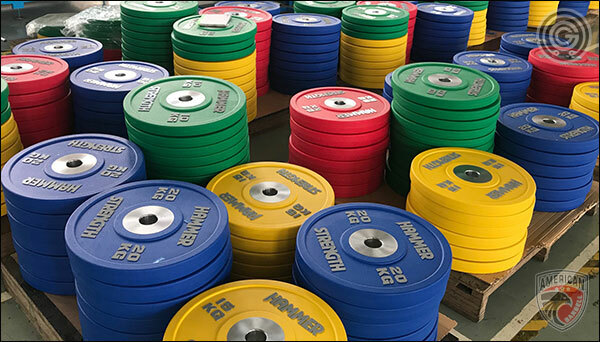 I get asked this one a lot… are American Barbell’s Urethane Bumper Plates different from all the other urethane bumpers on the market? The answer is yes. American Barbell created and holds the patent for all the urethane bumper plates you see being sold everywhere. To my knowledge, every version of the urethane bumper plate you see today is a copy of the original American Barbell Urethane Plate. That said, American Barbell has a newer version of their Urethane Bumper Plate; a version that is supposedly 12 times more durable than the original model; withstanding upwards of 120,000 drops before fatigue starts to become apparent. The word is that no other vendors have this new version of the urethane plate because American Barbell took manufacturing in-house rather than outsourcing production to 3rd party factories. With no incentive to sell the design and no indiscriminate factories being able to back-door the design, this disc will likely remain exclusive to AB for at least a little while. Now whether or not any other manufacturers have reverse engineered this new plate or not is beyond me, but I certainly haven’t heard any indication of that. 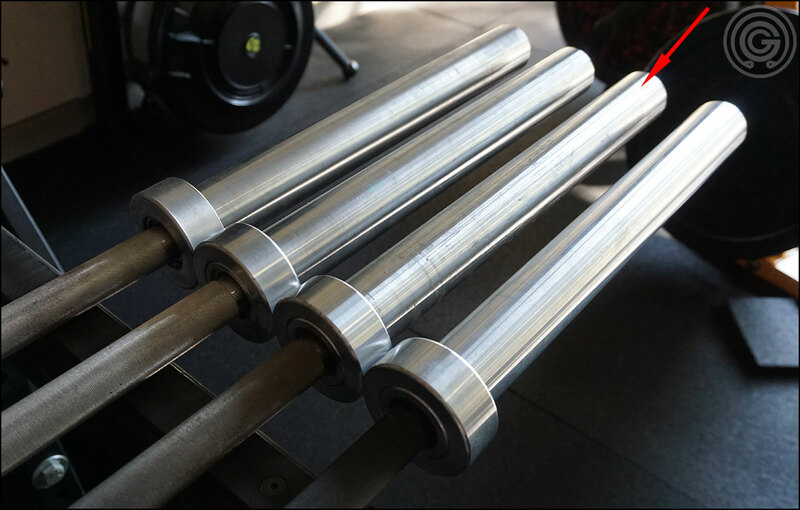 If you have been considering buying an American Barbell bar and you have stumbled upon this rust complaint, well I want to put your mind at ease – American Barbell bars do not rust. Their stainless steel and Cerakote shafts will not rust, nor will their industrial chrome shafts or sleeves. 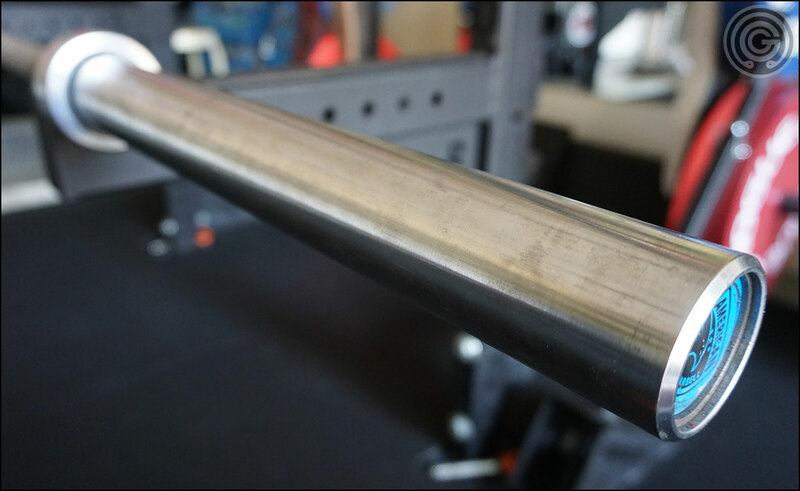 Short of rubbing on your bar with a wire brush or steel wool, or throwing it in the Gulf of Mexico you will not have rust issues with an American Barbell bar. Now if you live in an extremely wet climate and don’t take care of your equipment, you’ll eventually have rust issues regardless of the manufacturer, but that’s not exclusive to AB at all. My personal previous generation American Barbell SS Comp Bearing Bar; it has the same sleeves as all American Barbell bars. This bar is over four years old; it’s garage kept, uncleaned, and it has zero oxidation. I do not know what this individual did to his AB Training Bar – there were never any pictures shown to give us an idea – but if he was getting rust on an industrial chrome-finished bar in a garage gym setting I can only assume it was brushed with a steel wire brush or simply left out in the rain for weeks (or both!) Either way, my point is that you have to seriously neglect or straight up mistreat a finished, garage-kept AB bar to experience even light rust. In case you’re wondering, I have no issue making these statements because, a) I’ve owned no less than eight different AB bars – six of which I still own; b) I live in nasty, humid Central Texas and I frequently have visible, heavy condensation on my equipment. Yes I have seen rust on my black oxide and unfinished equipment (my Ohio Deadlift Bar is half brown) but to this day not a single AB bar has had oxidation issues. Not a trace. Four different American Barbell bars ranging from one year old to over four years old. The marked bar (red arrow) is a Super Power Bar with rather deep scratches and gouges from some heavy use over the years. Still no rust. So no, there is no reason to avoid American Barbell over these rust claims. And what about those bushings? There is nothing wrong with American Barbell bushings. AB uses high-load, incredibly high-quality, self-lubricating composite bushings. They won’t spin like a 15¢ needle bearing while unloaded in a rack but they can handle an excessive amount of weight before slowing, and they will last forever. End of story. In any case, the bar that lost it’s Rogue Killer status is a fantastic Olympic bar, and AB bars in general are among the best on the market. I’m not sure if a bias was developed at some point after original publication, but the negative comments and the subsequent retraction of that title is very misleading, and while I don’t normally get into other blogger’s business I do think these comments are harmful to a reputable company and warranted being refuted. Just about every bar in American Barbell’s line-up can currently be found in their closeout section as either blemish bars or open-box bars; which I assume means returns. The level of discount varies by bar, of course, but there are definitely some savings to be had. American Barbell makes some of the best bars in the industry so they are by no means the cheapest bars out there. This may be the perfect opportunity to get an amazing bar with an insignificant cosmetic blemish for a really good price. I’ve seen countless of reviews on AB bars from the bodybuilding equipment forums to Reddit to instagram and YouTube. People I would call casual users and reviewers to very picky equipment snobs. AB gets unbelievable marks from everyone. Their barbell shipping is definitely top of the market from what I’ve seen, and their bars are often peoples go to bars. People who buy from them are often convinced that they’ve jumped the ship from Rogue and other reputable companies for good. Glad to see some rebuttal. 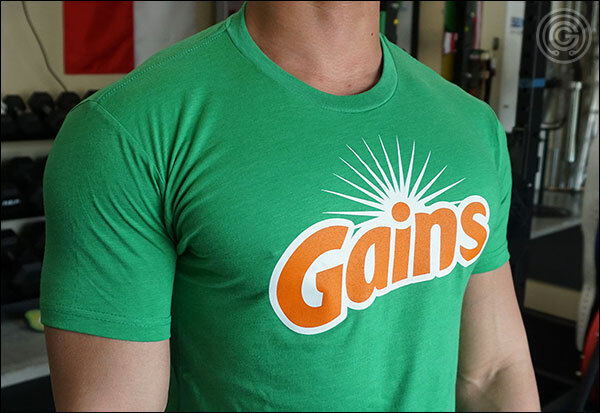 So you’re a American Barbell salesman now? I wouldn’t shame you if you really were. On a serious note, from all the good reviews & great feedback I hear about AB, I am deeply considering them if I ever feel like I want/need to buy new bars in the future. The way you reviewed their SS Comp bar & the video you made of how smoothly & effortlessly the shaft spins with all that weight on the sleeves was just mesmerizing. I hope I start learning to olympic lift somewhere in the near future, & have the chance to purchase & experience that masterpeice of a bar! 5- & either 28.5 or 29 mm diameter shaft. You may find 2 out of 4, at most. I don’t know if these bars are just not popular enough to mass produce, but if AB would produce a competitor to the Rogue B&R or Chan bar (which both have – at least 4 of – the specs mentioned above) I would sure be tempted to buy one. In any case, Burgeson, I thank you for opening my eye to AB, & hope I can acquire one of their bars some day soon. Yeah really the only true multi-purpose bar they offer is the California, which was their answer to the Ohio line. I personally think the fact that it’s a 28 mm bar is a perk since multi-purpose bars are generally considered WOD bars to a great extent, and 28 mm bars make better Oly/WOD bars. The B&R and Chan are the only two multi-purpose bars that I can think of off the top of my head that clearly lean towards powerlifting more than Olympic lifts/WODs, so for the time being most will still lean on those for that purpose; and there is nothing wrong with that. Though having said that, I actually think the B&R is a straight up power bar with dual marks. Dual marks alone don’t make a 29 mm bar multi-purpose. Technically any bar can be used for anything, but you know what I mean. I have one of the AB stainless steel wod bars and the sleeves do gather surface rust in our Crossfit box in Georgia. It’s not terrible but it does happen. It does happen, but you should only ever see rust on these bars in areas where there is no longer any chrome covering the steel. Of course you can also get rust on chrome from contact with other steel products; usually cast change plates and fractional plates. Even tiny steel shavings deposited on a chrome shaft can rust if not wiped away, and it may look like the chrome is rusting but it’s not. When this happens, the chrome is very easy to clean the rust from because that rust is literally sitting on the surface (AB bars are especially easy to clean since the sleeves aren’t grooved). This is what causes stainless steel to rust for some people by the way – non-stainless metal particles sitting on the bar. But still, having surface rust on a 3-4 year old AB bar that’s seen heavy usage in a CrossFit box doesn’t alarm me so much because no doubt there is some missing finish at this point; scrapes and gouges and such; but having enough rust on a new AB bar in a single-user garage gym that you give it a bad review does raise some flags for me. I find it peculiar and suspect, which is why I chose to address it. My Eleiko Sport Trainer also has rust. Neither bar has ever had a metal plate on them. The Eleiko also has never been in a rack. I think the sliding on and off of the metal inserts causes scratches over time and the worn off chrome does rust. It’s not a big deal but I don’t abuse the bars and they do get surface rust. Our head trainer has a cerakoted AB bar she’s had 6 months or so and the sleeves also have minor surface rust. At least in our box they all rust. I’m amazed at the environment you have where they don’t. I might literally pass out if I saw rust on my Eleiko bar, but luckily that hasn’t happened. I was a Crossfitter for years before I moved into my garage gym, and I can tell you there’s no comparison to home use with stuff you’ve personally purchased and the way people treat equipment in boxes. The chalk use alone is insane and contributes a ton to oxidation. Outside of that, I too am tired of my wife and kids complaining about the chewed up skin between my traps from squatting heavy with my Vulcan SS PB and am now in the market for a power bar with less aggressive center knurl. Since AB is the place for more passively knurled power bars, I’m anxiously awaiting your comparison of the Elite & Mammoth. I remember you calling the Mammoth a “bragging rights” bar or something similar. However, I still can’t really find any way it’s better than the Elite other than tensile strength and the Cerakote. I understand the improved oxidation but if we generally prefer untreated steel and SS is already superior to Cerakote in terms of oxidation resistance I don’t see this as a plus. Actually the Elite is more like an upgraded Super Power Bar (29 mm vs 28.5 mm) than the Mammoth. However, everyone that reviews a Mammoth raves about it. The Elite always gets good marks but doesn’t seem to have that same it factor that makes it stand out. Would love to know why. Also interested in what you think about the cosmetic blemish prices vs upcoming BF prices. The Mammoth is priced way down whereas the Elite is only $75 off. I know AB usually does free shipping on bars but can’t remember if they’ve offered percentage discounts in the past. You’re probably going to cover all this in your comparison review, but I’m impatient, haha. Maybe just an ETA on that article will hold me over. I’ll say this: I’m less inclined to give the Mammoth hell now that I have one. It is the only way to get a Super right now, and it is closer to a Super than the Elite is; even with the Cerakote. But yeah haha, I’m not too far off from finishing the review. Maybe a week or so out. AB tends to offer discount pricing during sales, but I can’t speak to what they’ll do this year. I would also assume the deeper the percentage discount on a blemish bar, the more obvious the blemish is. If the SS has cosmetic issues AND the Cerakote finish didn’t apply correctly it may not be the prettiest bar. I’m the wrong person to ask about blemish bars because I’ve always been on the fence about them. Seems like everyone is generally happy I just can’t get over the what-ifs of it and buy one myself, so it doesn’t feel right to come right out and say “yeah you should do it!”. Yeah I’m going to pass on the blemish sale with BF so close. I was really hoping for those urethane plates to be added to closeout and they are now but $500 shipping kills it. Pretty close to the new price with free shipping. Odd how companies do that. For example, Rogue sells med balls with free shipping but frequently posts seconds on their closeout page for around $15-20 off plus $15-20 shipping effectively making them the same price as new. Who are these for? Are there really that many people spending $5000 or buying a rig who want to save $20 on a med Ball? To me, if a set of new plates gets free shipping a comparable set of seconds plates should also get free shipping. Otherwise, it’s not a discount. Will probably go with the best deal between the Elite and the Rep SS PB on BF because I’d love to pick up an Elite FTS SSB and/or a DL Bar as well. Definitely pass on the AB closeout sale bars. A guy on bb.com got a pretty bad Mammoth bar (rust on sleeve, uneven weld on sleeve, cerakote damage, etc.) and AB is giving him a hard time about getting a refund. Lame. Also, the AB urethane bumper plate new prices just went up a bunch. I bought a new set a few months ago with plans of adding to it, but I may be selling them all now that the price went way up (due to increases in production costs, they say). They’re nice, but not THAT nice. I’ll probably pick up some Rogue Training or Comp plates on Black Friday and get a bunch more weight for MUCH cheaper than AB’s urethane plates. I’m still a huge fan of AB’s bars, but I wouldn’t risk buying a closeout bar.